SampleRadar remembers the days when it had to practise its arpeggios for piano exams, but these days, it's happy to play a note or chord and let a synth do the work. Which brings us to this week's collection of sounds, which contains fast and furious arpeggios from a range of synths. The samples are split into folders, each of which is labelled to give you an idea of what's contained within. All the samples are supplied as 16-bit WAV files so can be imported directly into your DAW or sampler of choice. Because they're royalty-free, you're welcome to use the samples in your music in any way you like - all we ask is that you don't re-distribute them. 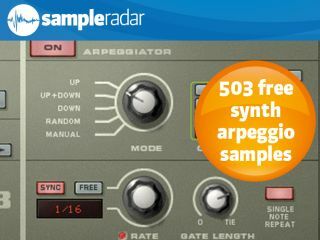 The synth arpeggio samples are supplied in a zip file, so you'll need to extract them before you can see them. Enjoy!